Life is an adventure. Trust important memories to a camera that delivers sharp, stunning photos and video that you can share instantly plus enjoy for years. Breathtaking shutter speeds nail difficult action shots with ease. Creative Modes turn your images and video into expressive art. 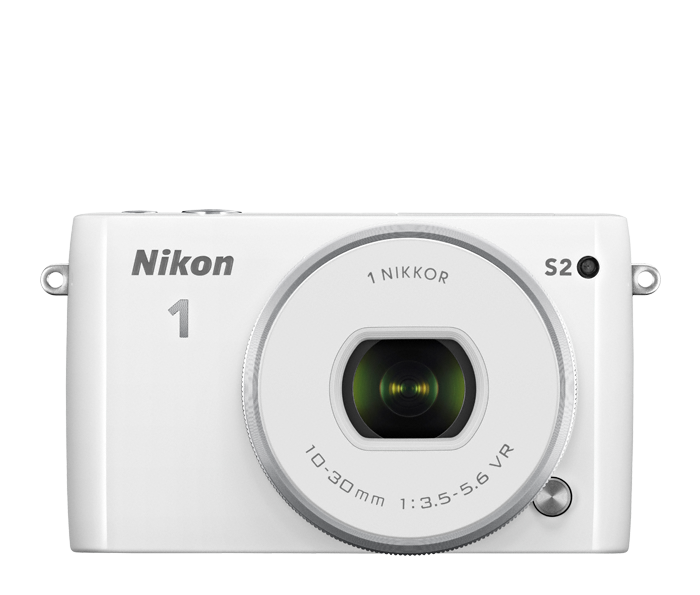 Compact, stylish, and full of easy-to-use advanced features, the 14.2MP Nikon 1 S2 is the camera you’ll never want to leave at home. Life doesn’t pause for shutter lag; make sure your camera can keep up. The Nikon 1 S2, equipped with the world’s fastest continuous shooting frame rate* at 60 fps fixed focus and 20 fps full autofocus, captures crisp, clear action shots. That means you won’t miss the perfect moment due to shutter lag or blurred focus. Life's fleeting moments deserve more than a smartphone. *Among digital cameras with interchangeable lenses available as of May 14, 2014; based on Nikon research. Elevate your images. From travel to adventure sports, why should your photos look average? Creative modes add originality to your photos and express your personal style. Add effects such as Selective Colour, Cross Process, Toy Camera and more to make your images uniquely yours. Even your videos can stand out using Fast Motion and Jump Cut to add fun effects. Stay social even away from home. Include friends and family in your exciting events and spectacular moments by sharing high quality images in real-time. Simply use the optional WU-1a Wireless Mobile Adapter to upload photos to a compatible smart device±, and then share them anytime, anywhere, by text, e-mail or even your favorite social media sites. Superb HD video, powerful controls, and fun editing options, all in the palm of your hand! 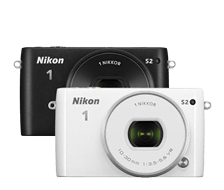 The multi-tasking Nikon 1 S2 shoots spectacular 14.2 MP stills and Full 1080p HD Video, simultaneously! Your videos never looked better thanks to electronic Vibration Reduction and fun new creative modes such as Jump Cut and Fast Motion. See a wonderful still shot? Shoot it simultaneously, without interrupting video, with a press of your finger. Disappointing photos are a thing of the past. Take stunning well-timed images using Active Selection and Live Image Control. Ideal for fast action, Active Selection shoots multiple images and lets you pick the shot at the peak of action. Preview advanced effects such as Background Softening or Motion Blur using Live Image Control using simple control sliders. Evening events, nightclubs and performances are notoriously hard to photograph. With a maximum ISO of 12800 and ISO Sensitivity Mode, the Nikon 1 S2 delivers crisp, rich, images without using a flash. 5/16 (m/ft ISO 100, 20°C/68°F) Approx.